Cherisse Stephens Ministries Presents God’s Cover-Girls Women and Girls Conference 2018! 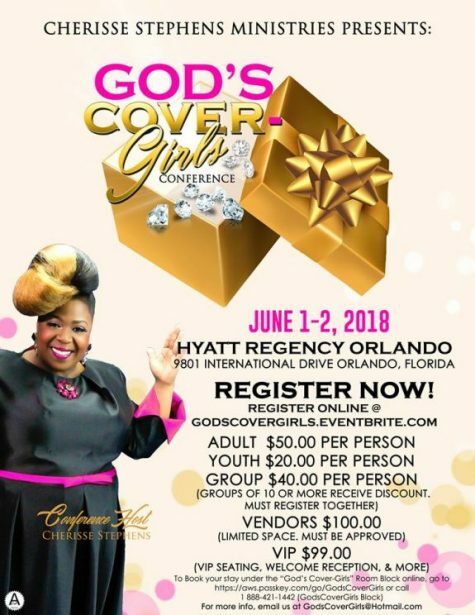 Women and girls from around the globe will gather at the Hyatt Regency Orlando, June 1-2, 2018, for the God’s Cover-Girls Women and Girls Conference. 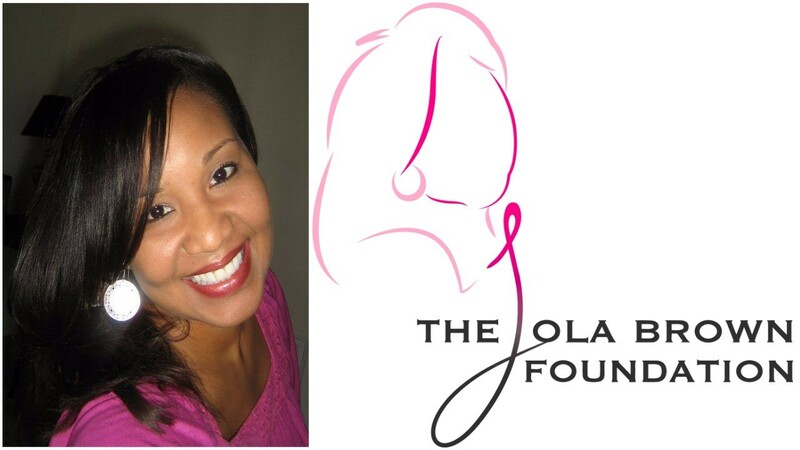 This conference was founded by Cherisse Stephens, CEO of Cherisse Stephens Ministries. This year’s God’s Cover-Girls Conference (GCGC) theme, “No Shade, All Son” is sure to bring inspiration and empowerment! Our message is clear! It’s your Time to SHINE, no matter what you’ve faced in the past. Our gathering will be a time of empowerment, healing, spiritual growth and self-awareness. We have organized classes, workshops, worship, a vision board party for the youth, shopping with specialty vendors and so much more! Orlando has so much to do and see. Focusing on self-esteem and awareness, training for success, healthy living (mind, body and spirit), and more, GCGC offers something for all ages. Those looking for spiritual renewal, strategies to jump start their careers or discovering their life’s purpose, will find that the nationally recognized speakers will arm them with the tools for success. Evangelist Cherisse Stephens, renowned Gospel recording artist, author and television host, founded Cherisse Stephens Ministries in 1994. Since then, the ministry has hosted several major conferences including Spring Forth into Destiny Family Conference, Prophetic Encounter and more. Cherisse Stephens is a graduate of The University of Phoenix and Grand Canyon University, where she received her associate of arts, bachelor of science in Business and master’s degree in Leadership. She is also a media specialist in the Gospel music industry and has hosted television for TBN’s “Praise The Lord” program and WATC’s flagship TV program; “Atlanta Live.” Additionally, she has also produced her own shows that air via television and social media. She has also appeared on The Word Network, TCT, Impact TV and many other Christian and secular networks. Cherisse Stephens is an international recording artist and her music continues to bless the nations. Most importantly, Evangelist Cherisse Stephens is proud to be the wife of Preston L. Stephens and the mother of their two awesome sons, Preston & Brandon. Her goal is to be the Proverbs 31 Woman, which is the Ultimate God’s Cover-Girl! “We desire to provide a real-life transforming experience – spiritually, emotionally and physically for every woman and girl we encounter. I believe that faith-based teachings combined with practical application, truly empower people for change,” says Stephens. 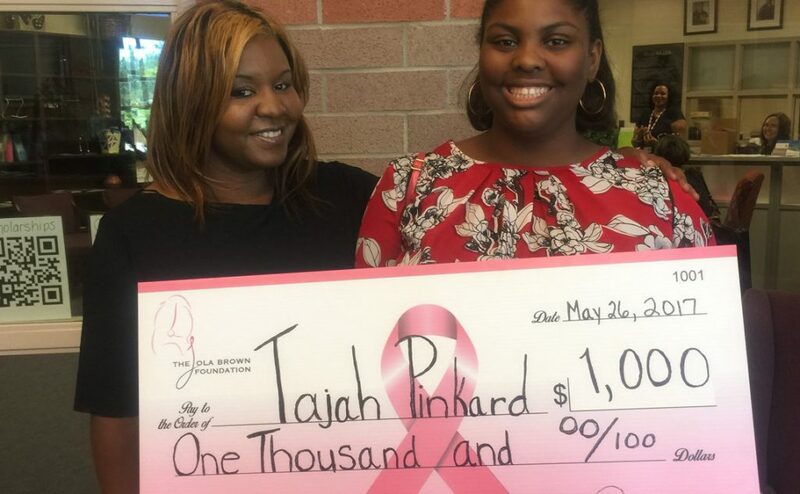 “We’ve been hosting these life-changing conferences for years, and each year we’re blessed to offer scholarships for our youth to attend our conferences, thanks to our sponsors and private donors. This year is no different. We are looking for businesses to sponsor a girl, a family or even a women’s small group to help offset the costs,” Stephens says. Attendees can register for the conference through GodsCoverGirls.Eventbrite.Com and through our online store via Square Market. Adult registration is $50; $20 for Youth; and $40 for Groups of 10 or more if registering together. The VIP registration is $99 per person and includes VIP seating, welcome reception and more. Vendor registration is $100 and available on a first-come, first-served basis as space is limited. To book rooms, go to aws.passkey.com/go/GodsCoverGirls or call 1 888-421-1442 (God’s Cover-Girls Room Block). For more information about GCGC 2018, e-mail GodsCoverGirls18@gmail.com or call the administrative office at 678.341.0371. 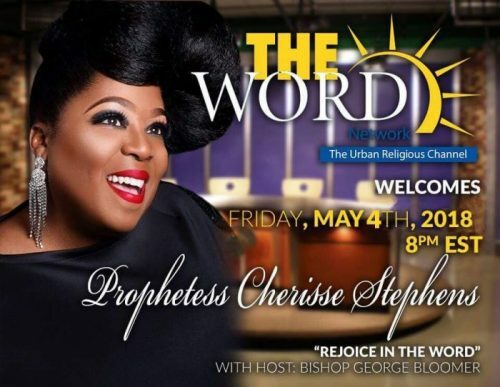 Finally, Evangelist Cherisse Stephens will be appearing on The Word Network THIS Friday, May 4 if you would like to get a taste of her ministry. Please see the flyer to the left for the details! TV One Presents 30th Anniversary “A Different World” 14-Hour Marathon TODAY!!! After today, we have to wait two more days til the Season Finale of OWN’s “Greenleaf,” but there are other opportunities for enthralling television entertainment until then! As a matter of fact, TV One will celebrate the 30th Anniversary of the premiere of “A Different World,” one of my FAVORITE shows of ALL TIME, with a 14-hour marathon on the same date the series launched, today, Sunday, September 24 at 10 a.m. ET. The marathon will begin with the pilot episode, which still reigns as the highest rated television pilot in history, garnering 38.9 million viewers. So after I get home from church, I will be watching! “A Different World” premiered on NBC on September 24, 1987 as a spin-off of The Cosby Show. The series originally centered on free-spirited, rebellious Huxtable daughter, Denise (Lisa Bonet), as she attended her parent’s alma mater, Hillman College. During season one, Denise struggles through college and meets memorable friends along the way, including Maggie (Marisa Tomei), Jalessa (Dawnn Lewis), Dwayne (Kadeem Hardison), and Whitley (Jasmine Guy). Seasons two through six capture the essence of being young, black and educated in America by tackling political, ethical, racial, emotional and social issues far before the media was ready to address them. The marathon celebrating the fictional HBCU will run from 10 a.m. ET to 1 a.m. ET and will feature a selection of the most popular episodes, in chronological order, containing memorable moments from each season of the series.Interstitials from cast and crew captured recently reflecting on their experiences with the series will also be featured during the marathon. The pilot episode will be presented as a special “Pop Up Edition” filled with show trivia at 10 a.m. ET and again at 8:30 p.m. ET to commemorate the same time the pilot premiered 30 years ago. On TVOne.tv and the network social platforms, fans can celebrate all week with daily editorial breaking down the most iconic moments, a video countdown of the top 5 moments of all time, and a ‘Where Are They Now?” photo gallery to catch up with your favorite characters. For more information about A Different World on TV One, visit the network’s companion website at www.tvone.tv. TV One viewers can also join the conversation by connecting via social media on Twitter, Instagram and Facebook (@tvonetv) using the hash tag #ADifferentWorld. 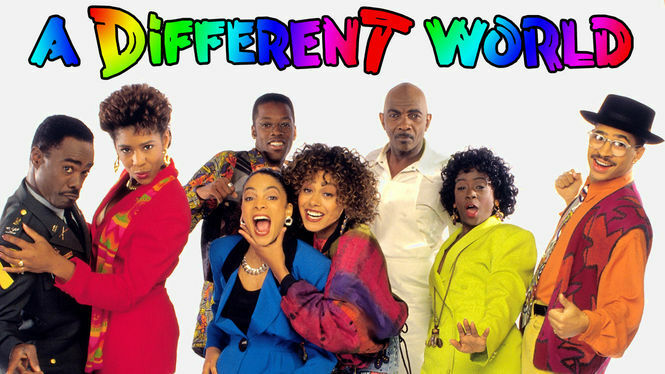 Check out TV One’s “A Different World” 30th Anniversary Promo Video Below!